Sorry, I'm a little tardy in posting this last race report. 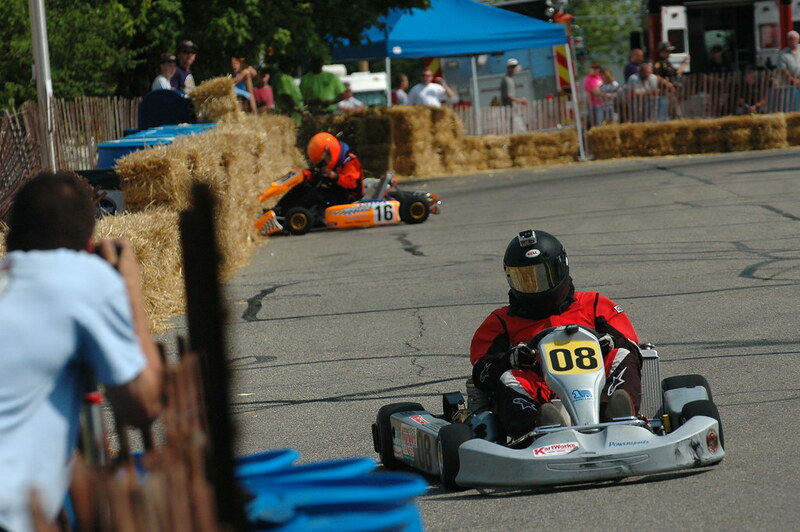 The Mid-State Ohio Kart Club ran their 5th points race of the year last Sunday (6/14) at Circleville Raceway Park. We ran CRP backwards (clockwise) this weekend for the second time this year. I am undecided on whether I like this configuration. It makes some of the corner combinations a blast to drive, but passing is next to impossible. The only really passing opportunities are at the end of the back straight and coming into Turn 9. The track is also much less tiring to drive CW, but I'm not really sure why. I just know that I have much more energy left for that last lap when we race clockwise. I started Heat 1 in P5 out of 7 karts. This put me on the inside row. I knew it would be difficult to move up in the field during the race, so the start was extra critical. The field roared into Turn 10 (Turn 1 when you run backwards) clean, and I stayed in 5th coming into Turn 9. I got a good run on the kart in front of me, but misjudged how much slower he was at the apex. I drove over his right rear wheel, did a small wheelie, tracked way right and almost ended up in the grass. So much for my good start. I shuffled back to 7th, and stayed there for the rest of the race. I was quicker than the P6 kart, but I could not get by him. For Heat 2, the field inverted so I was set to start in P3 until a kart opted to start in the back which moved me to outside pole. I held my position at the start and built up a healthy lead after the 1st lap. Paul Milleman, the points leader, started in 5th and rapidly moved up through the field. He caught me on the 3rd lap and snuck under me in Turn 9. I tried to follow him the best I could for the next 3 laps and cruised home in 3rd. My Heat 1 finish killed my qualifying effort. I started in P5 out of the 7 karts and moved up to 4th with a move to the outside on Turn 9 of the 1st lap. I could not match the pace of the 3rd pace karts, but was able to build up a gap to the karts battling for 5th place behind me. I cruised without anyone near for the majority of the race until the 5th place kart slammed into the back of coming into Turn 10 at about 60mph. I found out after the race that she was having brake troubles, locked the brakes up coming into Turn 10, got sideways, and hit me in the process which caused her to loop the kart (see picture below). This scattered the karts behind me. I came home safely in 4th place. I still can't quite get to the podium! I posted the start of the feature race and helmet cam footage of the feature below. I'm headed to Mid-Ohio this weekend to work for Team Cardiosport in the Koni Challenge Series and my next kart race is the weekend after. I posted lots of new photos to Flickr over the past few days. Here are a few of the best. I made the trek to Michigan International Speedway to watch the endurance race of this year's FSAE East Competition last month. I posted a bunch of photos of 24 Hours of LeMons car I am building with three friends from work. We are building a 1985 Ford Ranger with inspiration from the big rigs that run the Pikes Peak Hill Climb. Basically, we removed the bed from the truck and added a huge rear wing which we built last weekend. The wing has been painted flat black since the picture was taken. Last weekend, I worked for Team Cardiosport at Watkins Glen. Cardiosport run a Porsche 997 in the GS class of the Koni Challenge Series. For the team, I do race/fuel strategy and change front tires during pit stops. Here is a picture from the paddock last weekend. 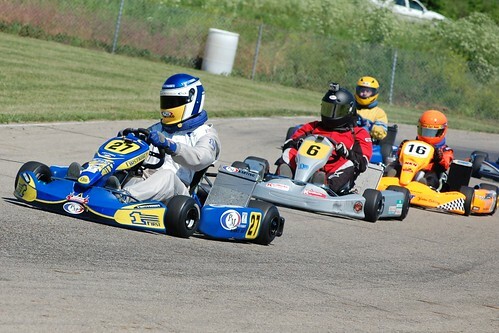 I have a kart race tomorrow at Circleville Raceway. It is the 5th points race of the year for the MSOKC. I've got the kart ready to go and the weather looks excellent so I'll hopefully have some good video footage to post. The MSOKC ran it's 4th points race of the year this past weekend at Circleville Raceway Park. 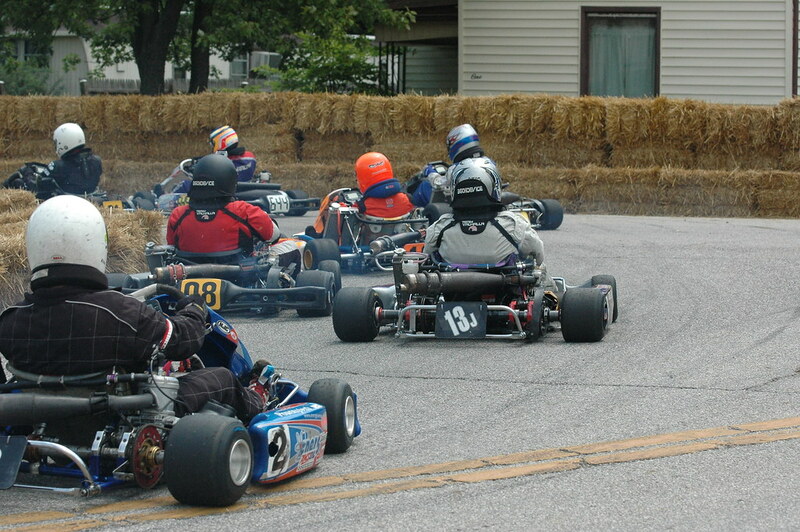 We had 9 karts this weekend in TAG with a slightly different race format than usual. The standard in sprint karting is for the shifter classes to do F1-style standing starts and all the direct-drive karts to do rolling starts. However, the MSOKC broke the norm this weekend and had all classes do standing starts for each heat race and the feature race. After the announcement, we all thought this would end in carnage with clutches grenading on track and karts getting run over at the start, but it all ran smoothly with no major incidents in any of the races. For Heat 1, I started in P4 out of the 9 kart field behind Paul Milleman of PM Karting who is leading the points championship and is regularly the fastest TAG kart in the field. He had a great start while the pole-sitter running a Sonik engine bogged at the start. I followed Paul to the outside and slid past the pole-sitter in turn 2 of the first lap to take 2nd place. I hung on to 2nd place until lap 5 when Matt Milless got under me in Turn 9. This got me off-line and I left the door wide open for two more karts to slip past me in Turn 10. 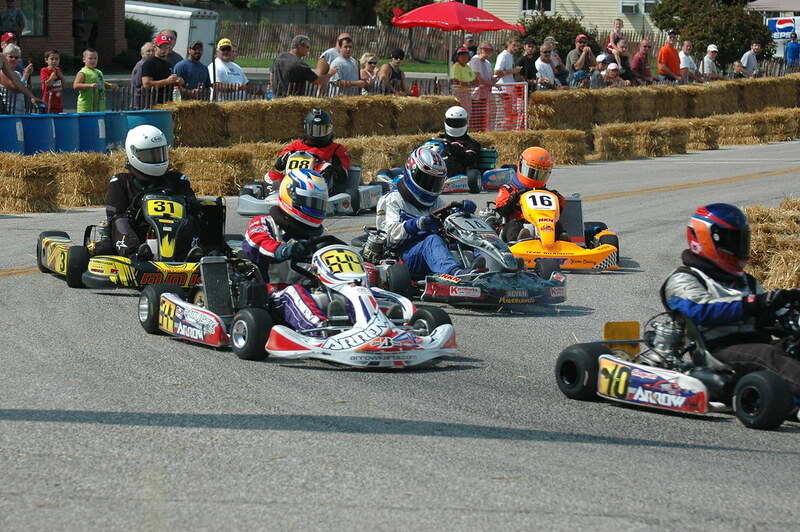 I finished 5th but moved up to 4th place when a penalty moved one of the top karts to the back of the finishing order. In Heat 2, I started in 5th right behind Bo Strawser who is in 2nd place in points. He was running the track-owner's Rotax-Tony Kart while waiting on parts for his kart and bogged at the start. I quickly maneuvered to the outside and was followed by Paul Milleman who started 7th and bump-drafted me into 2nd place by Turn 2. Paul is quick so I was only able to hold him off for one lap but stayed in 3rd for the rest of the heat. My kart was handling much better in the 2nd heat after a tire pressure and front track adjustment. This allowed me to hold off the rest of the field and not drop back like in Heat 1. Corner exit oversteer killed me in Heat 1. My 4th and 3rd place finishes in the heats put me in P2 for the feature race. This is my best feature qualifying effort so I was stoked. On the grid, I almost jumped the start and as I got back on the brake to recover, the green flag dropped which killed my reaction time. Paul Millemean rocketed into 2nd and the P3 kart got past me to the outside but I was able to duck under her in T2 to take 3rd place. I stayed in 3rd until, again, I left the door wide open in Turn 10 on lap 3. Angel Wilkinson dove under me and we made contact coming on the front straight. I thought I could make a run and pass her in T urn 3 so I stayed right on her bumper through Turn 1. As I exited Turn 1 the kart snapped sideways and I put two wheels off as I corrected the slide. In the process, I straddled the curbing outside of Turn 1 and caught the sprocket causing my chain to fly off. This ended a promising day in a frustrating way. I keep improving week in and week out so I need to keep reminding myself that this was only my 8th kart race and I'm racing against guys/girls who've been running karts since they were 10. Either way, I'm ready to take my first podium in two weeks with the MSOKC returns to Circleville for the 2nd clockwise race of the year. I posted a few videos from the weekend below. Sunday was a perfect day for racing. It started out a little chilly but by noon it was sunny and 70 with not much of the typical Ohio wind. For the 3rd points race of the season, the MSOKC ran counter-clockwise at Circleville Raceway. 13 TAG karts showed up this weekend to make it the biggest field of the year so far for the MSOKC and the most karts I've race against yet. Practice went well despite the cold conditions. Grip was sparse but I managed to click off mid 45 second laps which was my goal. My kart and I got warmed up nicely with no mechanical issues. I did, however, pull off early in the 2nd practice because I picked up a big vibration in the rear axle. I was worried I'd bent my axle or blown a bearing but it turned out I picked up a few big rocks with the rear tires. That was a relief! With the Heat 1 grid randomly set, I started 12th out of the 13 starting karts. Luckily, this put me on the outside of row at the start. Coming into turn 1, the two karts in front of me dove into the inside line causing the classic problem of too many karts and not enough real-estate. While they got jammed up as each of the inside karts had to let off the throttle in a corner that should be flat, I drove to the outside and ducked under the 7th place kart in turn 3. Not bad for the first three corners of the race. I stayed in 7th for three laps but was closing on P6. On lap 4, the P6 kart went wide in turn 3 and I was able to dive underneath over the curbing to take 6th place. I crossed the finish line with a huge 12th to 6th jump. Passing karts is the key to a good starting spot for the feature and I was lucky to be able to take advantage of the traffic jam on lap 1. Between heats, I made a few key setup changes to the kart with the help of Paul Milleman of PM Karting. In practice and Heat 1, my kart was unstable and difficult to drive. It oversteered on entry and exit so it was clearly time for a setup adjustment. We widened the front and rear tack, toed the front end out by 0.5mm per side and adjusted front camber. This made the kart much more driveable and I dropped about 0.4 seconds on my fastest lap. With the field flipped, I started on outside pole for Heat 2. I dropped to 3rd on the first lap and stayed there for the next two laps. I was not driving well in the track's LH corners and it cost me two more positions on lap 4 and 5. I finished 5th. The feature race grid is set by your points sum from Heat 1 and Heat 2. With two consistent Heat race finishes, I started 4th for the feature. This is my best start in a field of over 10 karts so I was pumped for the final. I really wanted to pick up my first legitimate podium (finishing 3rd out of 6 karts doesn't count in my book). I got a decent start was was able to move under Angel Wilkinson in Turn 3 to take over 3rd. I put a 2-3 kart gap on Angel and kept it until lap 6 when Mike Under got past her. He was a bit faster than both of us so he caught me and passed me in Turn 9. At this point, I was wiped. I have never gotten this tired in a kart race before and it really effected my lap times. I lost about a half second per lap for the last three laps. On lap 8, Angel dove under me in Turn 10 and we made contact. My LF tire got into her right bumper and RR tire causing me to track out and get passed by the P5 kart who was on her tail. On the last lap, I thought I had a nice gap back to 7th place and I was too far from P5 after the contact on the previous lap, so I put it in cruise control until the checker. I learned a hard lesson in the last corner of the last lap as the P7 kart dove under me to take 6th place away. All I had to do was keep pushing and I would have easily kept 6th. It was a dumb mistake but I learned from it. It was a disappointing end to an exciting race where I was in podium position over half-way through the race. I posted a video of the feature race below. For now, I need to get into better shape so I'm going to go for a jog. Team Yaw Moment Racing had two goals for the weekend: 1) Avoid the rain and 2) Run every lap of the weekend incident free. I did not want a repeat of the first race and come home with 0 championship points after two races. Both goals were achieved this weekend. We ran Circleville backwards (clockwise) this weekend which basically meant all my practice and testing in the offseason running counter-clockwise went out the window. I have only run this configuration once about 7 months ago so I was a bit rusty. The track was still wet in places for the first practice so it was difficult to put the power down coming out of the corners without a nice powerslide. The 2nd practice was uneventful as I used the 5 laps to re-familiarize myself with the clockwise racing line and braking zones. The starting order for Heat 1 was randomly assigned and I started in P1. I was a little nervous to be leading the field into Turn 1 with 3 or 4 faster drivers following me, but we all made it through unscathed. On the 2nd lap, Bo Strawser made the pass for 1st place in turn 2 and never looked back. I held the rest of the field off for the next three laps. Racing into the hairpin at 63 mph after the back straight at Circleville, the 3rd place racer bump-drafted me NASCAR-style in the braking zone. It forced me wide in the hairpin but I stayed on track. Three karts passed me in the process though dropping me to 5th place out of 8. I finished 0.2 seconds behind 4th place after rough driving between P3 and P4 caused a near spin for the P4 driver, but I couldn't make the pass before the finish line. Starting P1 for the 1st heat means starting in the back for Heat 2 when the field is flipped. Heat 2 was a very clean race with mainly single-file racing. I moved up to 6th place after a stuck throttle and black flag sidelined the 6th and 7th place starters. I really started to notice my lack of pace in this heat as I struggled to keep up with the 5th place racer. After a few laps, the kart was really sluggish out of the corners and it felt as if the axle was binding on corner exit. A problem in the braking system is causing my rear caliper to hang on the rotor after the kart heats up. I'm thinking either water/junk in the brake lines is expanding and preloading the caliper pistons or faulty caliper seals are causing the pistons to not return. With this holding me back and a lack of experience in this configuration, I could only muster a 6th place finish in Heat 2. I started 6th for the Feature Race, but, man, it was a boring race. There was not a single racing pass during the 10-lap race. 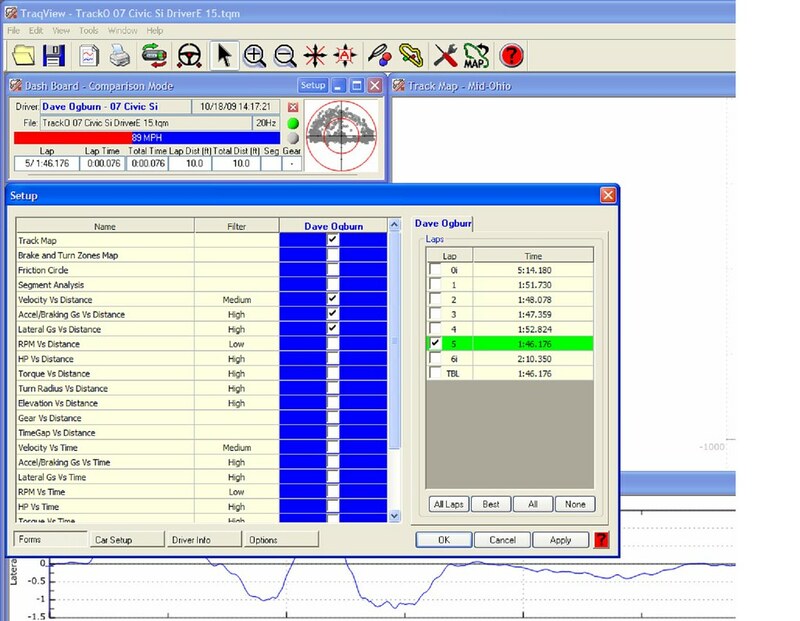 Each person gapped the surrounding karters and no one made a mistake except for Angel Wilkinson going off track while in 4th place and losing her chain. With her mishap, I came home safely in 5th place out of 8 and survived the weekend with no big parts bills! I posted a helmet cam video of the feature race below. Next time I will take video for the heat races and the feature because the heat races are generally more exciting. I'll post the most entertaining race to watch. YMR's next race is a week from yesterday at Circleville Raceway Park running CCW. This will be the 3rd points race of the year for the Midstate Ohio Kart Club and an important race for me to pick up the pace and start bringing home better finishes! My 2nd race of the season is tomorrow at Circleville Raceway Park and we are running the track backwards so it should be a challenge. Unfortunately, I had to work today so no practice day before the race so I need to make the most of tomorrow's practice sessions. The forecast is looks great, 70 and Sunny all day, except for the chance of scattered thunderstorms. The Midstate Ohio Kart Club does not run in the rain so either its safe to drive on slicks or no pack up and go home. I've been itching to get back to the track since the frustrating first race so please do your non-rain dance for central Ohio. I certainly am!